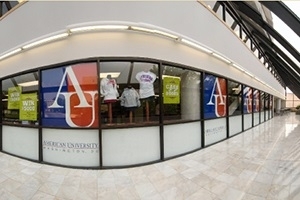 The American University Campus Bookstore is undergoing major changes. The main one being that it will no longer sell textbooks on site. All course materials will be sold exclusively online at shopAmericanU.com. Not too long ago, buying textbooks and other required course materials at the campus bookstore meant waiting in long lines. But starting this fall, American University students won’t have to do that thanks to big changes at the AU Campus Bookstore. The main change? The store has moved all course material sales—including textbooks—online to its website at shopAmericanU.com. To minimize delivery time, online orders will be shipped from a local distribution center. The campus bookstore will continue to offer free in-store pick-up so students can save on shipping costs and grab their online orders more conveniently. In addition, AU negotiated a new discount with Follett (the campus bookstore provider) that will save students an additional 10 percent when purchasing new or used textbooks. To place an online order, go to shopAmericanU.com, click “Books” on the top navigation and follow the prompts to select the materials for your courses. Follett also has modernized the bookstore with a cutting edge new look that includes bold AU graphics celebrating community spirit and campus life. First-floor renovations have made room for an expanded collection of general merchandise, including new clothing and accessories, as well as a devoted online order pick-up area. The move to online text ordering also coincides with significant changes to the bookstore’s layout. Challenged with an increased need for space for events and student organization use, the university worked with Follett to convert the store’s former lower level into the new University Club and student event space. Renovations are expected to be complete later this fall. University bookstores across the nation have been selling textbooks online for quite some time. But the online component has largely served to compliment the onsite sales of textbooks in the brick-and-mortar campus stores. But that is rapidly changing and AU is one of the latest universities to adopt the textbooks available only online model.